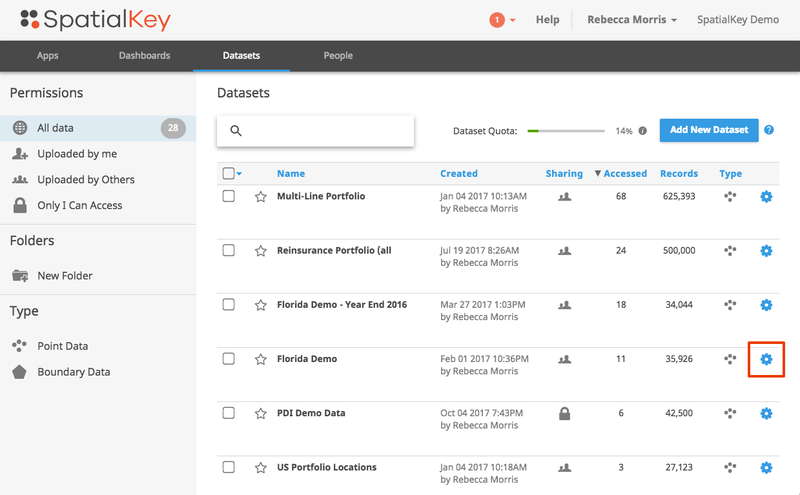 You data has been uploaded into SpatialKey, you’ve had your first cup of coffee, now it is time to open your first dashboard! Find your dataset in the Datasets tab and click on the gear icon to view data settings, then click to “Open in Map Analyst”. Select how to visualize your data in the dashboard. Heatmap, Points, Circle Clusters, and Bivariate Grid maps create clusters of your records so you can see where the densest areas are on the map. These clusters can be visualized using the heatmap or graduated circle rendering methods. Thematic Shapes maps render your data by geographic shapes, such as states, or zip codes. 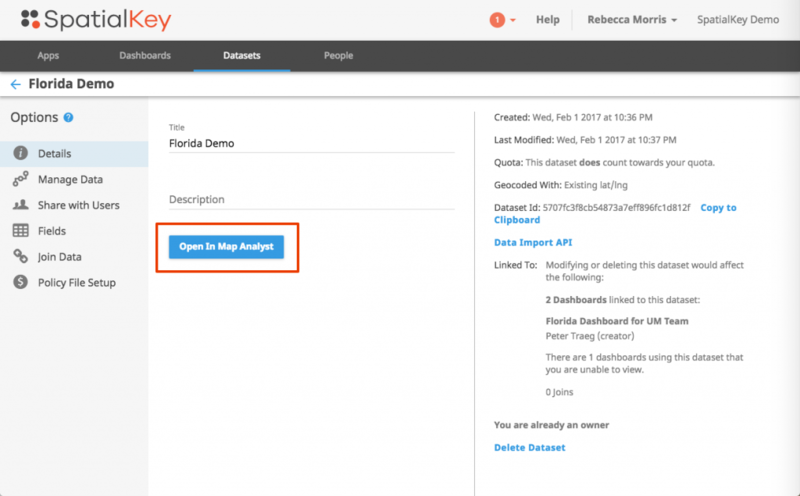 Let SpatialKey Decide how to visualize your data offers a quick one-click option to get into your dashboard! Depending on which option you select for your map, you may be asked a couple of questions before your dashboard is ready. For example, if you select the heatmap options, you will be asked to select what the map should display – either number of records or another calculated value. That’s all there is to launching your first dashboard. Don’t sweat the options on these screens because you can easily change how your data is visualized from the Layer Manager within the dashboard. Check out Navigating the Dashboard and Adding Visualizations for some tips on interacting with your dashboard.